Above all else you should strive to acquire three things, and so begin to attain what you seek. The first is freedom from anxiety with respect to everything, whether reasonable or senseless - in other words, you should be dead to everything. Secondly, you should strive to preserve a pure conscience, so that it has nothing to reproach you with. Thirdly, you should be completely detached, so that your thoughts incline towards nothing worldly, not even your own body. Then sit down in a quiet cell, in a corner by yourself, and do what I tell you. Close the door, and withdraw your intellect from everything worthless and transient. Rest your beard on your chest, and focus your physical gaze, together with the whole of your intellect, upon the center of your belly or your navel. Restrain the drawing-m of breath through your nostrils, so as not to breathe easily, and search inside yourself with your intellect so as to find the place of the heart, where all the powers of the soul reside. To start with you will find there darkness and an impenetrable density. Later, when you persist and practice this task day and night, you will find, as though miraculously, an unceasing joy. For as soon as the intellect attains the place of the heart, at once it sees things of which it previously knew nothing. It sees the open space within the heart and it beholds itself entirely luminous and full of discrimination. From then on, from whatever side a distractive thought may appear, before it has come to completion and assumed a form, the intellect immediately drives it away and destroys it with the invocation of Jesus Christ. From this point onwards the intellect begins to be full of rancor against the demons and, rousing its natural anger against its noetic enemies, it pursues them and strikes them down. The rest you will learn for yourself, with God's help, by keeping guard over your intellect and by retaining Jesus in your heart. As the saying goes, "Sit in your cell and it will teach you everything." Question: Why cannot the monk attain perfection by means of the first and second form of keeping guard? Answer: Because he does not embark on them in the proper order. 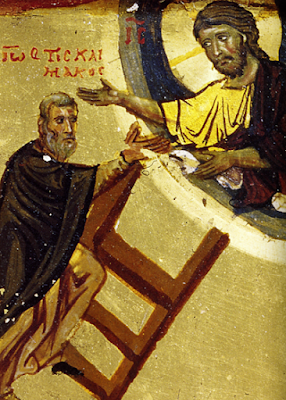 St John Klimakos likens these methods to a ladder, saying, "Some curtail their passions; others practice psalmody, persevering most of the time in this; others devote themselves to prayer; and others turn their gaze to the depths of contemplation. When examining this question let us use the analogy of a ladder" (The Ladder, Step 27). Now those who want to ascend a ladder do not start at the top and climb down, but start at the bottom and climb up. They ascend the first step, then the second, and so the rest in turn. In this way we can ascend from earth to heaven. If, then, we wish to attain the perfect stature of the fullness of Christ, like children who are growing up we must start to climb the ladder set before us, until progressing step by step we reach the level of a full-grown man and then of an old man. The first age in the monastic state is to curtail the passions. This is the stage of beginners. The second rung or stage whereby a person grows up spiritually from adolescence to youth is assiduously to practice psalmody. For when the passions have been curtailed and laid to rest, psalmody brings delight to the tongue and is welcomed by God, since it is not possible to sing to the Lord in a strange land (cf. Ps. 137:4), that is to say, from an impassioned heart. This is the mark of those who are beginning to make progress. The third rung or stage in life, marking the spiritual transition from youth to manhood, is to persevere in prayer. This is the stage of those who are already well advanced. Prayer differs from psalmody just as the full-grown man differs from the youth and the adolescent, according to the scheme that we are following. In addition there is a fourth rung or stage in spiritual life, that of the old man with grey hairs. This signifies undeviating absorption in contemplation, and this is the state of the perfect. So the journey is complete and the top of the ladder has been reached. Since this is the way in which matters have been appointed and arranged by the Spirit, it is not possible for a child to grow up to manhood and to attain old age except by mounting the first rung of the ladder and so climbing up to perfection by the four steps in succession. For someone who desires spiritual rebirth, the first step towards the light is to curtail the passions, that is to say, to guard the heart; for it is impossible otherwise to curtail the passions. The next stage is to devote oneself to psalmody; for when the passions have been curtailed and laid to rest through the heart's resistance against them, longing for intimate union with God inflames the intellect. Strengthened by this longing the intellect repulses all distractive thoughts that encircle the heart, attempting to get in, and it rebuffs them through attentiveness. So it applies itself assiduously to the second stage, that of attentiveness and prayer. This then stirs up the evil spirits, and the blasts of passion violently agitate the depths of the heart. But through the invocation of the Lord Jesus Christ they are utterly routed and all the tumult melts like wax in the fire. But though they have been driven out of the heart the demons continue to disturb the intellect externally through the senses. However, because they can only trouble it superficially, the intellect soon regains its serenity; none the less, it can never be completely free from the attacks of the demons. Such freedom is to be found only among those who have attained full manhood - who are totally detached from everything visible and who devote themselves unceasingly to giving attention to the heart. After that, those who have achieved attentiveness are raised little by little to the wisdom of old age, that is to say, they ascend to contemplation; and this is the stage of the perfect. Thus if you practice all this in due sequence, completing each phase at the right time, your heart will first be cleansed of the passions, and you will then be able to concentrate wholly on psalmody; you will be able to wage war against the thoughts that are roused by the senses and disturb the surface of the intellect and you will gaze heavenwards, if need be, alike with your physical and your spiritual eyes, and will pray in true purity. Yet you should gaze upwards only occasionally because of the enemies that lie in ambush in the air. God asks only this of us, that our heart be purified through watchfulness. As St Paul says, if the root is holy, so also will the branches and the fruit be holy (cf Rom 1 1 : 16). But if without following the sequence of which we have spoken you raise eyes and intellect to heaven in the hope of envisaging noetic realities you will see fantasies rather than the truth. Because our heart is still unpurified, as we have said many times, the first and the second methods of attentiveness do not promote our progress. When we build a house we do not put on the roof before laying the foundations - this is impossible. We first lay the foundations, then build the house, and finally put on the roof. We must do the same in relation to spiritual matters. First we must lay the spiritual foundations of the house, that is to say, we must watch over the heart and curtail the passions arising from it. Then we must build the walls of the spiritual house, that is to say, through the second form of attentiveness we must repulse the turbulence of the evil spirits that fight us by means of the external senses, and must free ourselves as quickly as possible from their attacks. Then we must put on the roof, that is to say, detach ourselves entirely from all things and give ourselves wholly to God. In this way we complete our spiritual house in Christ Jesus our Lord, to whom be glory throughout all the ages. Amen. From The Philokalia, vol. 4, "The Three Methods of Prayer."